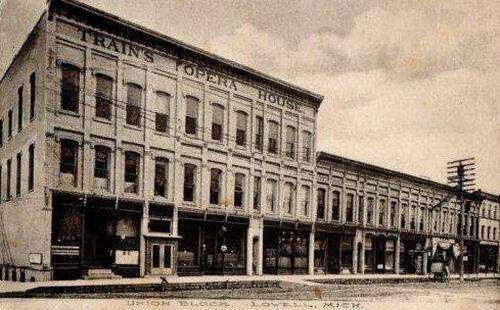 I don't know anything about this opera house or Lowell, MI but I get curious and tried to find the building on the postcard. This is it as 198 Fulton St. The façade has been updated, but the quantity of windows is correct and it even has the one narrow window at the 4th from the right. Follow that window down and you can see the same columns at the sidewalk level. You don't need to post any of this at the site, I just wanted to let you know it was still there and give you the address. I'll email the google street view image I used to find this opera house. Thanks, Seth.